Hi, I am Masato, a writer! This time, Node.jsInstallLet’s learn how to do it. We have compiled a method for each OS, such as Windows, Mac, Linux, etc. Please make sure to reference it. We will also explain about how to use them. In this article, learn how to install Node.js firmly and aim to improve your skills! In this chapter, let’s look at how to install Node.js on Windows and Mac OS. We will mainly learn about the method using the installer and the operation from the command line. 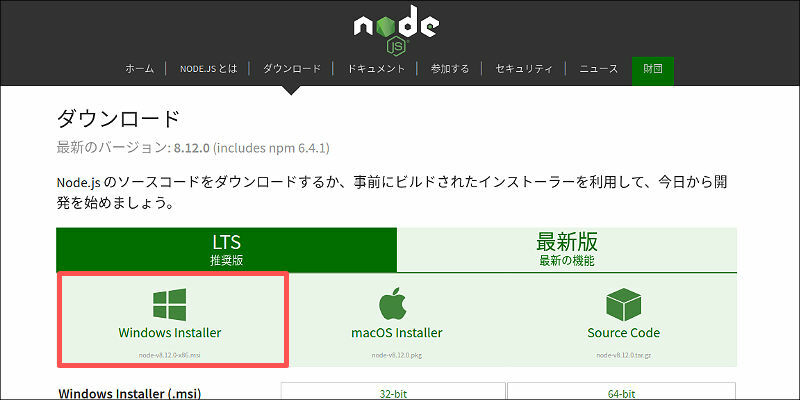 First of all,WindowsLet’s look at how to install Node.js. do it,LTS tabof“Windows Installer”Click on the button. Then you can download the installer program and just run it!